OK, let me say at the start that I LOVE my Orbea Gain E-Bike. 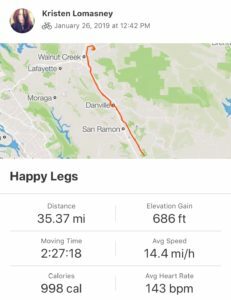 As way of background, I’m a 48-year-old woman who is 5’3” and 128 pounds, and I’ve been riding a Specialized Ruby, which weighs about 19 pounds. I’m primarily a roadie, and last year, I rode 4,200 miles. The previous year, I rode 3,730 miles. But while I love to ride, I am not a big fan of hills (my longest climb is 443ft) or really INTENSE workouts. 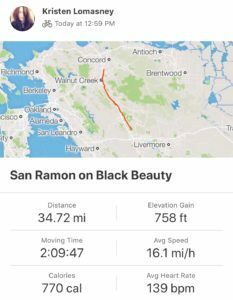 Whenever I ride with my husband-equivalent (and Frame Up Bikes co-owner) Tom Crenshaw I name the ride “Tom Is Trying to Kill Me” on Strava. I was dubious about riding an e-bike, which, frankly, seemed like cheating to me. I take great pride in my time in the saddle, and I wondered what the impact on my fitness level would be. I also worried I’d hate riding a regular bike after riding an e-bike, and that was unappealing. 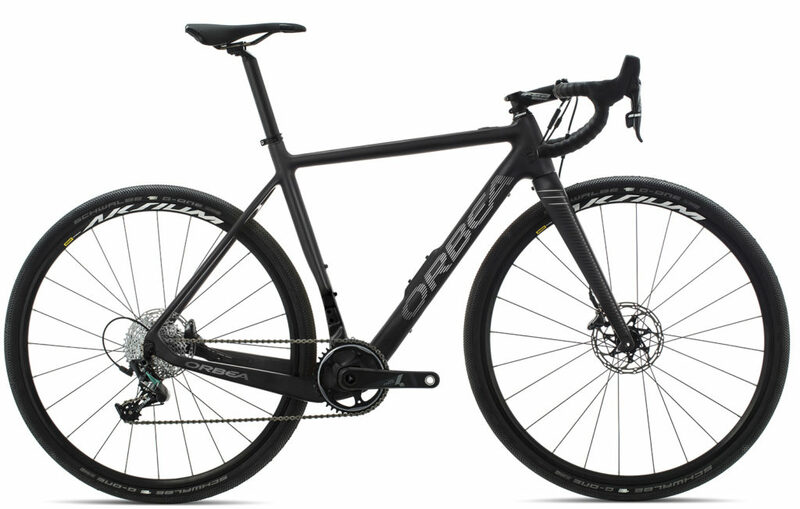 But the idea of being able to ride farther and more varied (read: hilly) routes won me over, so I bought the Orbea Gain (which is about 25 pounds). On weekends I have a regular 35-mile route, which is fairly flat — about 700 feet elevation. The data from my Ruby ride and my Gain ride are interesting to compare: my average heart rate was only four beats less per minute on the Gain, although I did complete the ride 20 minutes faster so the overall time in the saddle was less for the same distance. 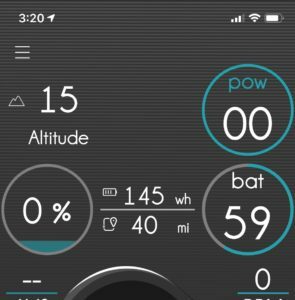 As for any “battery level anxiety” you may have, there is a free mobile app that lets you access that and other data at any time. According to the app, I used about 40% of my battery power on that ride, so now I know that after more than two hours of riding on the lowest level, I will still have more than half the battery left. And I actually could have ridden longer, but I was interested in comparing the exact rides, so I didn’t stray from the route. 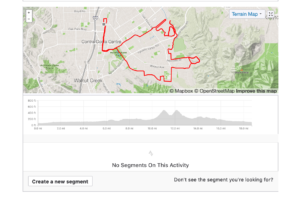 I am not sure that I will invest in a phone mount for my handlebars, but it seems likely that companies like Garmin and Wahoo will eventually add more e-bike specific features to their GPS units. What I’ve found with the Orbea Gain so far — at least on flat-ish ground — is that I tend to like the lowest of the three power-assist levels (green), which makes me feel like I am riding with a tailwind. I’m still pushing myself; I’m just covering more distance and I feel like I have more energy left in my legs to add miles and time. After I park the Gain at Frame-Up Bikes, I ride the Ruby home, and while I thought it would be a painful ride — especially given a big hill at the end — it isn’t at all. It just feels like I’m riding without a tailwind. Hurrah! “Regular” bikes are still a pleasure for me to ride! I should add that I tend to be conservative on my rides; especially if I’ve ridden more than 100 miles in a week (which was the case this week), I’m more likely to turn around earlier in case my legs run out of oomph — there have been a few times I’ve truly limped home after pushing it too much, cursing myself for overextending. But now I don’t have that fear; I can just turn up the power-assist level if my legs give out. This is actually a great comfort to me. The next test for the Gain will be hills and a truly punishing ride. I do have some experience on hills with the Gain: on my inaugural ride, I tried Arbolado Dr., which has a 10% grade in certain sections. The first time, I had the power assist setting in low, and while I made it to the top, I was breathing so hard I started coughing. The second time, I moved the power assist to its highest setting (red), which made the climb much easier (although it was still hard; I was definitely looking up hoping to see the crest every few seconds). This is promising, given the hills on some of the rides Tom has proposed we go on together. One last note: I have Di2 on both my Ruby and my Gain, and I can’t say enough about electronic shifting. On my old Trek, I had regular mechanical shifting, and it was just really awkward for me to shift since my hands are so small and the angle of the shifters was so wide. My answer to that was just to not shift, which ended up killing my knees. With Di2, I can shift with just a tap, and it’s made riding much easier. My knees and I are grateful. I’m currently keeping my Orbea Gain at Frame Up Bikes for people to see and demo. Even if you’re a skeptic like me, it’s worth a try — especially if you’d like to explore more of what your area offers and you don’t quite have the fitness level or time. Believe me, even on this pedal-assist bike you’ll still get a workout and be able to ride farther in a shorter period of time. Stay tuned for a follow-up post once I’ve ridden the Orbea Gain with Tom, which will be sure to be a long and hilly ride. I’m looking forward to seeing some of the scenery I’ve only been able to experience via photo so far and riding with confidence that I can make it home! Stay tuned. Shameless Plug added by Tom: Frame Up Bikes has a selection of electric pedal assist mountain, road/gravel and commuter bikes to rent and try for yourself, including Orbea Gains in x-small, medium and large.